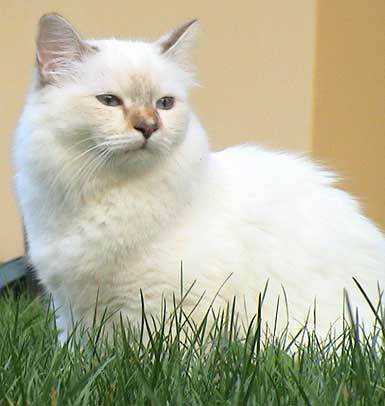 Pointed cats have very clearly contrasted points, where the body is virtually white, while the points are the normal shade for that colour. In tabby points, the back may have slight tabby shading, but if these markings are clearly defined then the cat is considered to have 'ghostmarkings', which are usually undesirable. Tabby Points look the same regardless of the 'type' of tabby that they are, so they are described as 'masking' the tabby pattern - you don't know by looking at them which type they would be. In Burmese-coloured cats, there is only a slight contrast between the body and the points. The only effect is a slight deepening of the colour around the cold areas. Burmese Tabbies show the tabby on their body, so you can tell which pattern they have. 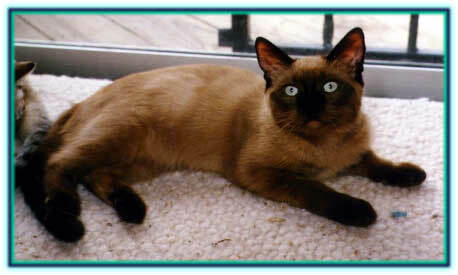 These take the form of 'Sable ticked tabby burmese' or 'Blue mackerel tabby burmese', but have not been detailed below. For details of the appearance of Burmese tabbies, compare the relevant Burmese colour description with the relevant Tabby description on the 'Tabby' page. Mink colouring is mid-way between Pointed and Burmese colouring. The points are the same colour as the other two, but the body is neither as light as Pointed cats nor as dark as Burmese cats. Tabby Minks show the tabby on their body, so you can tell which pattern they have. These take the form of 'natural ticked tabby mink' or 'Blue mackerel tabby mink', but have not been detailed below. For details of the appearance of Tabby Minks, compare the relevant Mink colour description with the relevant Tabby description on the 'Tabby' page. Body colour is an even, pale magnolia. Points deep seal-brown. A 'thumb-mark' of lighter colour in front of the ears (see this link). Body colour is an even, pale magnolia. Points deep seal-brown with patches of deep ginger-red. A 'thumb-mark' of lighter colour in front of the ears. The face should have a blaze of red (see this link). Body colour is an even, pale magnolia. Points have markings like a normal tabby cat in deep seal-brown. Markings are dense, clearly defined and broad. A 'thumb-mark' of lighter colour in front of the ears (see this link). Body colour is an even, pale magnolia. Points have deep markings like a normal tabby cat in deep seal-brown with patches of deep ginger-red. A 'thumb-mark' of lighter colour in front of the ears. The face should have a blaze of red (see this link). Body colour is an even, pale magnolia. Points dark midnight-blue. A 'thumb-mark' of lighter colour in front of the ears (see this link). Body colour is an even, pale magnolia. Points dark midnight-blue with patches of light yellow-orange. A 'thumb-mark' of lighter colour in front of the ears. The face should have a blaze of cream (see the 4th & 5th pictures at this link). Body colour is an even, pale magnolia. Points have markings like a normal tabby cat in dark midnight-blue. Markings are dense, clearly defined and broad. A 'thumb-mark' of lighter colour in front of the ears (see this link). Body colour is an even, pale magnolia. Points have deep markings like a normal tabby cat in dark midnight-blue with patches of light yellow-orange. A 'thumb-mark' of lighter colour in front of the ears. 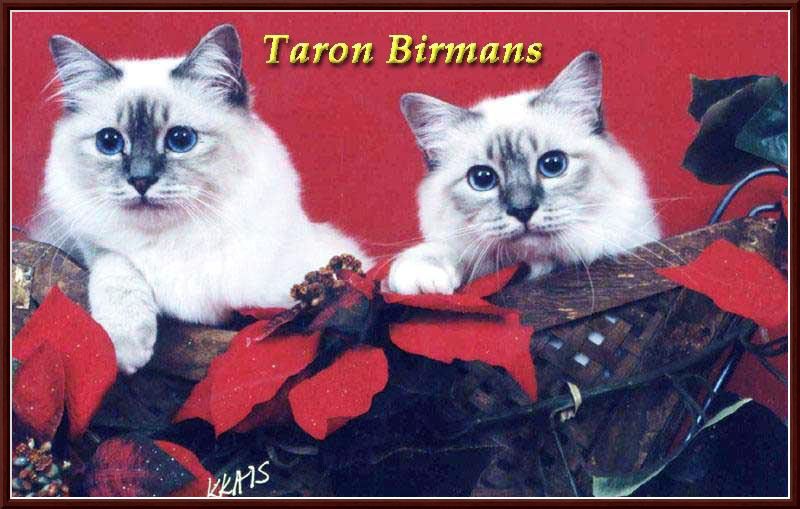 The face should have a blaze of cream (This link shows a Birman - these have mittens, so the points are not visible on the legs). Body colour is an even, pale magnolia. Points warm chocolate-brown. A 'thumb-mark' of lighter colour in front of the ears (see this link). Body colour is an even, pale magnolia. Points warm chocolate-brown with patches of deep ginger-red. A 'thumb-mark' of lighter colour in front of the ears. The face should have a blaze of red (see this link). Body colour is an even, pale magnolia. Points have markings like a normal tabby cat in warm chocolate-brown. Markings are dense, clearly defined and broad. A 'thumb-mark' of lighter colour in front of the ears (see this link). Body colour is an even, pale magnolia. Points have deep markings like a normal tabby cat in warm chocolate-brown with patches of deep ginger-red. A 'thumb-mark' of lighter colour in front of the ears. The face should have a blaze of red (see this link). Body colour is an even, pale magnolia. Points pale lilac-grey. A 'thumb-mark' of lighter colour in front of the ears (see this link). Body colour is an even, pale magnolia. Points pale lilac-grey with patches of light yellow-orange. A 'thumb-mark' of lighter colour in front of the ears. The face should have a blaze of cream (see this link). Body colour is an even, pale magnolia. Points have markings like a normal tabby cat in pale lilac-grey. Markings are dense, clearly defined and broad. A 'thumb-mark' of lighter colour in front of the ears (see this link). Body colour is an even, pale magnolia. Points have deep markings like a normal tabby cat in pale lilac-grey with patches of light yellow-orange. A 'thumb-mark' of lighter colour in front of the ears. The face should have a blaze of cream (see this link). Body colour is an even, pale magnolia. Points rich reddish-brown. A 'thumb-mark' of lighter colour in front of the ears (see this link). Body colour is an even, pale magnolia. Points rich reddish-brown with patches of deep ginger-red. A 'thumb-mark' of lighter colour in front of the ears. The face should have a blaze of red (see this link). Body colour is an even, pale magnolia. Points have markings like a normal tabby cat in rich reddish-brown. Markings are dense, clearly defined and broad. A 'thumb-mark' of lighter colour in front of the ears (see this link). Body colour is an even, pale magnolia. Points have deep markings like a normal tabby cat in rich reddish-brown with patches of deep ginger-red. A 'thumb-mark' of lighter colour in front of the ears. The face should have a blaze of red. Body colour is an even, pale magnolia. Points pale beige-tan. A 'thumb-mark' of lighter colour in front of the ears (see this link). Body colour is an even, pale magnolia. Points pale beige-tan with patches of light yellow-orange. A 'thumb-mark' of lighter colour in front of the ears. The face should have a blaze of cream. Body colour is an even, pale magnolia. 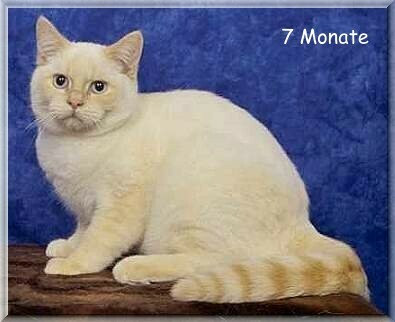 Points have markings like a normal tabby cat in pale beige-tan. Markings are dense, clearly defined and broad. A 'thumb-mark' of lighter colour in front of the ears (see this link). Body colour is an even, pale magnolia. Points have deep markings like a normal tabby cat in pale beige-tan with patches of light yellow-orange. A 'thumb-mark' of lighter colour in front of the ears. The face should have a blaze of cream (see this link). Body colour is an even, pale magnolia. Points deep ginger-red. A 'thumb-mark' of lighter colour in front of the ears (see this link. This cat clearly shows the tabby markings as mentioned in the note on the 'Explanation' page. Body colour is an even, pale magnolia. Points have markings like a normal tabby cat in deep ginger-red. Markings are dense, clearly defined and broad. A 'thumb-mark' of lighter colour in front of the ears (see this link). Body colour is an even, pale magnolia. Points light yellow-orange. A 'thumb-mark' of lighter colour in front of the ears (see this link). Body colour is an even, pale magnolia. Points have markings like a normal tabby cat in light yellow-orange. Markings are dense, clearly defined and broad. A 'thumb-mark' of lighter colour in front of the ears (see this link). Body colour is a dark chocolate-brown. Points deep seal-brown. A 'thumb-mark' of lighter colour in front of the ears (see this link). Body colour is a dark chocolate-brown with well-defined patches of ginger-red. Points deep seal-brown with patches of slightly darker ginger-red. A 'thumb-mark' of lighter colour in front of the ears. The face should have a blaze of red (see this link). Body colour is a dark slate blue. Points dark midnight-blue. A 'thumb-mark' of lighter colour in front of the ears (see this link). Body colour is a dark slate blue with well-defined patches of light yellow-orange. Points dark midnight-blue with patches of slightly darker yellow-orange. A 'thumb-mark' of lighter colour in front of the ears. The face should have a blaze of cream (see this link). Body colour is a mid-chocolate-brown. Points dark chocolate-brown. A 'thumb-mark' of lighter colour in front of the ears (see this link). Body colour is a mid-chocolate-brown with well-defined patches of ginger-red. Points dark chocolate-brown with patches of slightly darker ginger-red. A 'thumb-mark' of lighter colour in front of the ears. The face should have a blaze of red (see this link). Body colour is a pale lilac-grey. Points very slightly darker lilac-grey. A 'thumb-mark' of lighter colour in front of the ears (see this link). Body colour is a pale lilac-grey with well-defined patches of washed-out yellow-orange. Points very slightly darker lilac-grey with patches of light yellow-orange. A 'thumb-mark' of lighter colour in front of the ears. The face should have a blaze of cream (see this link). Body colour is a mid reddish-brown. Points rich reddish-brown. A 'thumb-mark' of lighter colour in front of the ears (see this link). Body colour is a mid reddish-brown with well-defined patches of pale ginger-red. Points rich reddish-brown with patches of deep ginger-red. A 'thumb-mark' of lighter colour in front of the ears. The face should have a blaze of red (see this link). Body colour is a very light beige. Points pale beige-tan. A 'thumb-mark' of lighter colour in front of the ears (see this link). Body colour is a very light beige with well-defined patches of washed-out yellow orange. Points pale beige-tan with patches of light yellow-orange. A 'thumb-mark' of lighter colour in front of the ears. The face should have a blaze of cream. Body colour is a mid ginger-red. Points deep ginger-red. A 'thumb-mark' of lighter colour in front of the ears (see this link). Body colour is a washed-out yellow-orange. Points light yellow-orange. A 'thumb-mark' of lighter colour in front of the ears (see this link). Body colour is a medium chocolate-brown. Points deep seal-brown. A 'thumb-mark' of lighter colour in front of the ears (see this link). Body colour is a mid-grey-blue. Points dark midnight-blue. A 'thumb-mark' of lighter colour in front of the ears (see this link). Body colour is a light chocolate-brown. Points dark chocolate-brown. A 'thumb-mark' of lighter colour in front of the ears (see this link). Body colour is a very light lilac-grey. Points pale lilac-grey. A 'thumb-mark' of lighter colour in front of the ears (see this link). Body colour is a pale reddish-brown. Points rich reddish-brown. A 'thumb-mark' of lighter colour in front of the ears (the left-hand kitten here is a Honey Mink, the right is a Platinum). Body colour is a light tan. Points pale beige-tan. A 'thumb-mark' of lighter colour in front of the ears. Body colour is a light ginger-red. Points deep ginger-red. A 'thumb-mark' of lighter colour in front of the ears (see this link). Body colour is a pale creamy-yellow. Points light yellow-orange. A 'thumb-mark' of lighter colour in front of the ears (see this link).